Where I grew up, hiking was just a normal part of my childhood day-to-day play. I lived down a seven mile, one lane dirt road in the middle of the Seattle watershed. No, it’s not normal for people to live in watersheds, they are generally private property with a lot of no trespassing signs posted but when Seattle bought thousands of acres to make their watershed, they forgot to buy a few hundred (someone had a bad day) which then got snagged up rather quickly by the public. We lived on the back side of rattlesnake ridge and uncharted territory was in abundance! It wasn’t until I graduated high school and went to college that I became a normal person who had to commute to hiking trails and mountains. Attending college in the Palouse at Washington State University meant I had literally one hiking trail to enjoy during my four years there that overlooked what else but wheat fields. It was it’s own kind of beautiful but not the alpine views and wild flowers galore that I craved. Fortunately after college, I got married and my husband’s job took us the the Olympic Peninsula! One of the first things we did when me moved over here was buy a trail guide and hike the mountains! 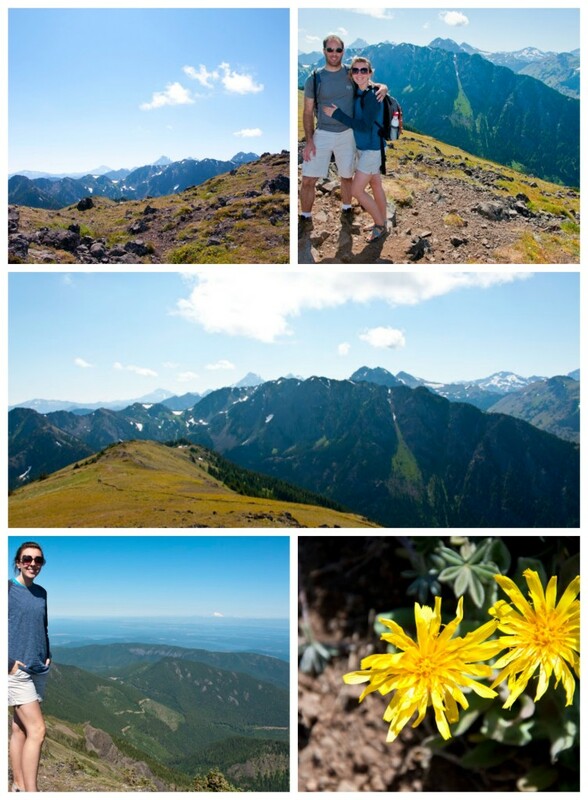 Over the years we’ve stepped foot on countless trails in the area but our favorite trail without question is Mount Townsend– a 6,280ft summit and said to be the most hiked summit in the Olympics. Mount Townsend is located out passed Quilcene, Washington in the Olympic Mountains. The hike begins with a journey through old growth, switchbacking right from the beginning. After skipping over several stream beds, trees thin out on the trail revealing meadows of wild flowers and striking views of snow capped mountains above the Puget Sound. Once above the tree line there is one last stretch of trail to power up before reaching the ridge summit. I typically jog this part up. Call me crazy but when the incline increases it’s easier for me to just power through and get to the top rather than chugging along slowly but surely. The views the summit provides are unimaginable and unbelievable to those who stand in front of them. With a turn of your head from left to right you will see Victoria, San Juan Islands, Canadian Cascade Mountains, Mount Baker, Twin Sisters, Glacier, Seattle, Cascades, Mount Rainier, Mount Adams, Hood Canal Bridge, Ferries, Port Townsend, Banger Base, and so much more! 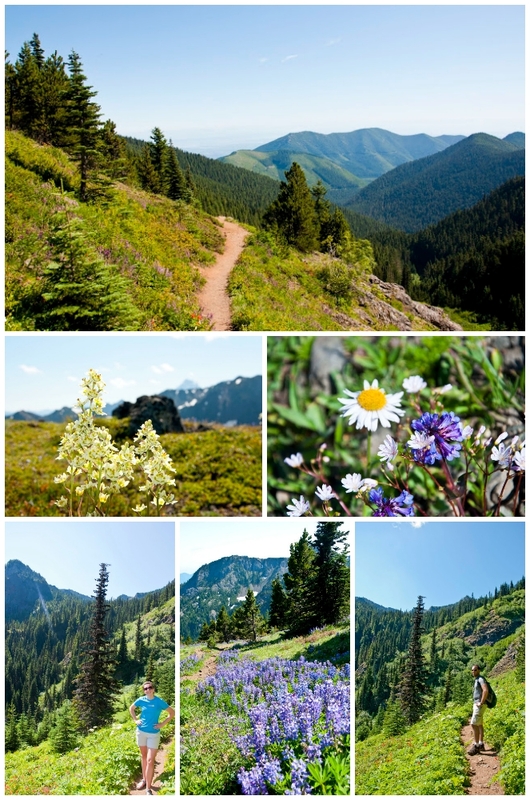 Round trip the Mount Townsend trail is 8.2 miles with a 2,900ft elevation gain. My ONLY complaint about the trail is how it wears on my knees during the decent. I took a few pointers from other fellow hikers and found it necessary to walk backwards down a few switchbacks to ease the pounding on my joints. Do you have any hikes (in Washington and else were!) that you would recommend?! Beautiful! This one is on my list, but it’ll have to wait until my baby is a bigger fan of car rides so we can make our way over there from Redmond. Some of my favorite hikes are: Noble Knob (but I just blogged about how much better it is when the road to the main trail is open, so don’t hike that one yet! ), Melakwa Lake (make sure to visit the upper lake), and Iron Peak (in late spring). Oh, and Sahale. And the Enchantments. And Valhalla. And Minotaur. And Defiance. And..and..and…okay, there are officially way too many favorites to mention. We live in one of the prettiest parts of the world, for sure. Thank you so much for those hike suggestions! I love having a good list of new ones to try! It is definitely a long drive out there for sure, I feel that way from Silverdale so Redmond, PHEW! The only one of those hikes that I knew about before you was the Enchantments! ← NW Healthy Mama Book Club—-Drum Roll Please!